Lovers, in the left corner you will find Chloe’s elegant Elah Leather Sandals; in the right corner cast your glamorous gaze upon Pour La Victoire’s magical Macbeth Flat Sandals. Though the Pour La Victoire pretties feature buttoned crisscross straps as opposed to the buckled crisscross straps of their couture counterparts; for just $135.80, in comparison to the $415.00 required to take the charming Chloe’s home, they are the perfect compromise for the cheap chica – and an adorable addition to one’s shoe collection! Tell me, kittens…will you be a big spender and go for Chloe, or be thrifty and spring for Pour La Victoire? Thanks to My Theresa and Shopbop for the pictures. I think I like the button! Pour La Victoire wins for me. So lovely, but I must be thrifty. I'm going for Pour La Victoire..it sounds expensive...at least. Great find! How cool! I'm glad you found a thrifty version. Such fun! Love the cheaper one. The Pour La Victoire shoes are so much better. I would definitely go for those. Ooh, how cute! I do like the buckle on the Chloe's a little better, though. 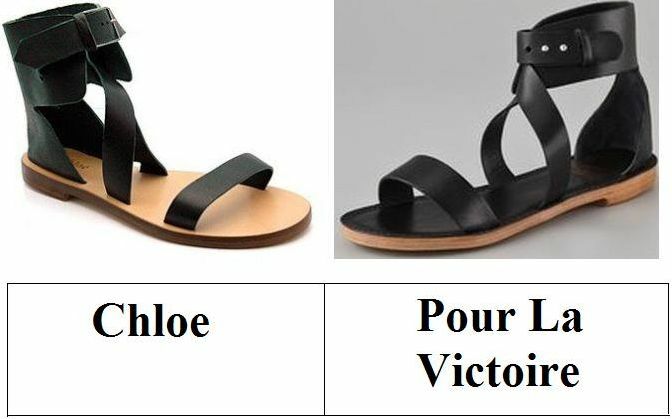 I actually love Pour La Victoire sandals more!! great find! i'd definitely be thrifty! Hope you've been having a wonderful weekend! They're cute. I love the Pour La Victoire pair. These are the shoes to have right now! Oh..and Guess what..Sam won the glee project! So he'll be on 7 episodes of GLEE this fall! Definitely the Pour La Victoire shoes!! But even then it's a little on the pricey side for sandals...albeit cute ones! I'd pass on both pairs. Awesome Discovery!! These Both Looks awesome, i really like Pour La Victoire!! I would love the Cloe ones due to the buckled crisscross straps but their price would force me to buy the other pair!! The PLVs totes work for me! i like pour la victoria. i like the Pour La Victoire sandals better because of the black on black--looks chic. Ive never had a pair of these trendy zip up or buckle Sandals...but I like the pair from Pour La Victoire. I love the buckles on the Chloe ones! I would choose the cheaper pair! I am all about a bargain.